If I already take red yeast rice, would adding high-dose niacin help further reduce my cholesterol levels, and would this be safe? I once took a dose of Lo & Slow Niacin (I think about 750 mg) along with 600 mg of Red Yeast rice, about an hour after taking Viagra, and while on a course of the antibiotic Bactrim. The next day I lost my ability to speak, and could not identify a stethoscope hanging around my doctor's neck. I was rushed to the hospital and treated for a TIA (mini stroke). My liver enzymes soared from the 20's to the 500's. Though overt symptoms disappeared within 30 minutes of their onset, and scans revealed no brain damage, my doctors declared me to be an afib patient, and put me on a blood thinner for the rest of my life - even though I suspect the event was evidence of hepatic encepalopathy (sp?). So - I would definitely not recommend mixing red yeast rice with high dose niacin - especially if you use ED drugs. Hope this is helpful. My doctor has had me taking both Red Yeast Rice and SloNiacin for nearly a year and the resulting decreases in both cholesterol and triglycerides have been remarkable. The combination is producing a better result than I had from a popular prescription statin drug and the leg pains I was having with the statin no longer occur. 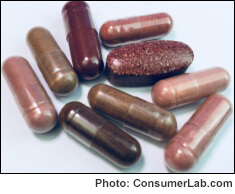 Consumer Reports says Red yeast rice is one of the fifteen worse supplements we can take. See the September 2016 issue on supplements. Hi Linda - The reasons given by Consumer Reports for "avoiding" this supplement relate to the effects of the cholesterol-lowering statin compounds it naturally contains. The warnings are similar to those for statin drugs. CR also notes that red yeast rice can, not surprisingly, increase the effects and side-effects of statin drugs. Red yeast rice has been shown to be very effective, with minimal side effects, in well-performed, independent clinical studies, so we do not agree that it is supplement to avoid. However, it is certainly one that must be carefully selected (due wide variations in lovastatin content and the potential for contamination) and properly used, as discussed in detail in our Red Yeast Rice Supplements Review. This CL Answer initially posted on 9/13/2013. Last updated 8/8/2017.